This stylish Scotia Bistro set features two ergonomically designed chairs with contrasting fabric and frame, which offers the whole set a very fashionable look. The accompanying small table is a great place to set books, drinks, snacks, or anything else sure to follow you to your new outdoor lounging area. Luxurious upholstery. European design. Aria 3-Piece Balcony set accentuates the carefree vibe of outdoor living. The Aria set mixes style and functionality with its premium steel frame and weather resistant fabric over padded cushions. The bistro set's contemporary table features a silkscreen printed glass in subtle wood grain effect. Set includes 2 chairs and 1 high-top table. Redefine your patio or deck's dicor with the help of the Marlboro 3-Piece Bistro Set. The light and delicate vibe of this furniture set combines a perfect marriage between traditional classical pieces and contemporary design. With its scrollwork design on the chair's backrest, the Mosaic 3-Piece Bistro Set goes well with any decorative theme you have in mind, whether you are aiming for a laid-back, neutral look, or a regal and majestic ambiance. The set's table top is structured with high-quality metal and ceramic while each chair is especially crafted with top-rate quality steel for longevity and durability. Enjoy your outdoor space with the Hampton Bay Megan Seagrass patio furniture set made with beautifully hand-woven wicker and durable steel furniture frames. The patio chairs boast deep, plush weather resistant cushions for ultimate comfort and longevity. The coffee table has a tempered glass inset and handy bottom shelves for extra storage. 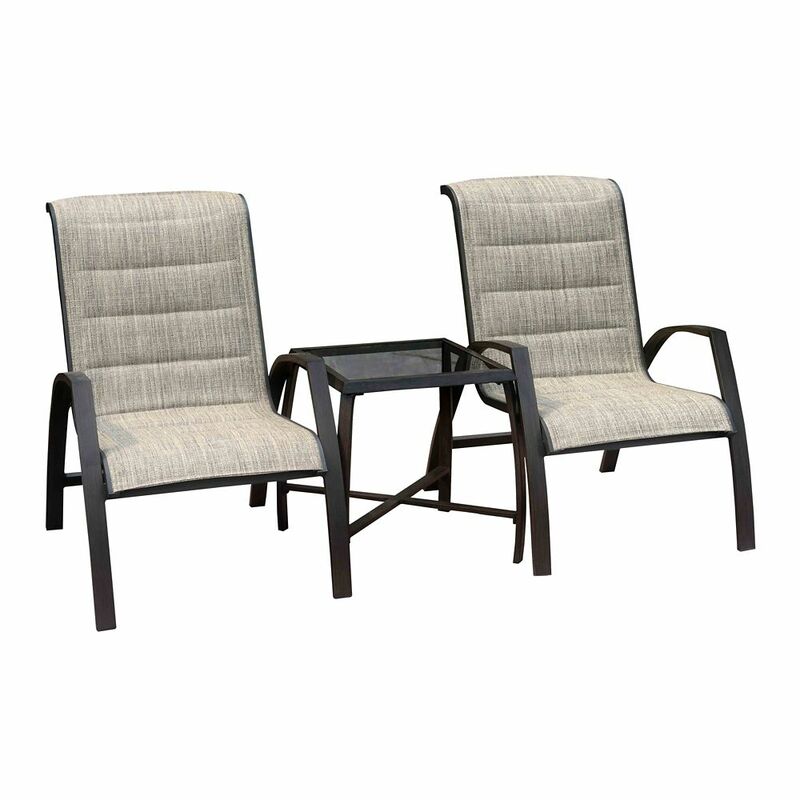 Perfect for your porch, patio or sunroom, each patio furniture set includes two lounge chairs and one coffee table. Scotia Bistro Set This stylish Scotia Bistro set features two ergonomically designed chairs with contrasting fabric and frame, which offers the whole set a very fashionable look. The accompanying small table is a great place to set books, drinks, snacks, or anything else sure to follow you to your new outdoor lounging area. Scotia Bistro Set is rated 4.8 out of 5 by 4. Rated 5 out of 5 by apple 2 from Most comfortable This Bistro-set is the most luxurious and well constructed, comfortable set we ever purchased. Rated 5 out of 5 by CP from Ideal set for relaxing. Purchased multiple bistro sets, however this on is my favorite for relax... Ideal set for relaxing. Purchased multiple bistro sets, however this on is my favorite for relaxing when on the patio. Rated 4 out of 5 by Linda from Am pleased with how set looks and like the contemporary... Am pleased with how set looks and like the contemporary design. Chairs are very comfortablle. Rated 5 out of 5 by Hinc from High quality set. Easy to assemble. Very high quality hardware. Some what higher price than other sets but the value is there. is this all one piece or 3 separate pieces? Hello, this is all 3pc Bistro Set.